The zombie trope presents a uniquely holistic horror, the gradual but inevitable collapse and decay of social, psychological and physical normality; when the z-apocalypse goes down there's a lot to deal with. Nestled amidst the carnage and existential angst lies the genres brutal ace, cannibalism. It's harsh enough dealing with the anarchy and lack of resources but it's the reality of being eaten alive that really pushes the survivors tattered sanity over the edge. The flip side of the zombie diet is that what you eat will soon enough get up and join the party unless its brain is consumed. Consequently the vast majority of zombies should display the evidence of at least partial cannibalism. To address this logic (?) I wanted to include a decent number of light, medium and especially heavily munched specimens. 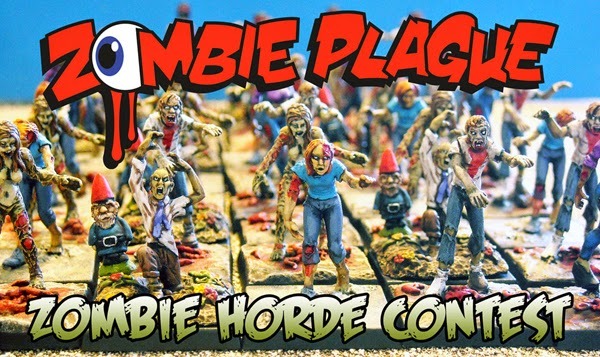 Sure there are plenty of miniatures with exposed flesh, missing limbs and trailing entrails (Eureka Miniatures zombies are unsurpassed for visceral carnage) but what about those caught by the mob and stripped to the bone? As a base kit to construct these zombie snacks I picked up the re-tooled Wargames Factory Skeletons. They're very delicate but accurately proportioned and crisply detailed. The skulls fit well on the Studio Miniatures and Wargames Factory zombies as well as the Zombie Vixens. With a little green stuff and a cocktail stick they can be given rotting, peeling flesh; leaving the skeletal face exposed for instant horror. For the nibbled on I simply removed limbs and replaced them with their equivalent from the skeleton sprue. Scale wise Studio Miniatures torsos and WF Zombie Vixens are an excellent match to the skeleton's anatomy. The Skeleton kit provides a wealth of weaponless arms (a possible part solution to this projects general lack of right arms). They're mostly closed handed so suffer a little from 'action figure grip' but I'm writing it off as rigor mortis! For the half eaten I chose zombie torsos with a cleanly defined waist and cut them in half, gluing both halves to their skeleton's counter parts. Fringes of green stuff torn flesh were added to define the boundary of the un/eaten halves. Hornby modelling putty (the white stuff) is slightly wetter than liquid green stuff and can be teased along skeletal arms and legs to form exposed musculature or built up and dragged with a cocktail stick for torn flesh and skin. For the most heavily cannibalised zombies I used a full WF skeleton body with a Mantic zombie head. A 'neck' can be cut from a sprue (cut at an angle to tilt the position of the head) and glued to the torso before attaching the head. Liquid green stuff was stippled onto the skeletons to create quick, easy and effective torn flesh with extra muscles and viscera modelled in green stuff putty. The full skeleton bodies are quite delicate with no obvious option for pinning to a resin base so I glued the first batch to their plastic bases, I'll paint these up as asphalt. I'm guessing that a couple of these lack the musculature for basic locomotion but the stripped down skeleton looks cool and should read nicely in the crowd. These ravaged cadavers should be fun to paint up in their butchered glory and add another layer of stark horror to the horde. These guys are making me think about having a large base of massed zombies that has just been shelled, using a blast damage style base with limbless cadavers and crawlers at the centre and tattered but relentless zombies on the outside. Gratuitous mayhem ahoy!! The Zedcember initiative has provided a great focus to finally complete some miniatures. Seeing the horde begin to take shape certainly makes the end goal seem more real and exciting!! Basing this first set of completed miniatures has also really helped bring them to 'life' (?!) and tie them in thematically. For all the Zedcember minis I've used the 'Bricks', 'Modern Cobbles' and 'Slabs' pavement bases sets from Antenocitis Workshop along with a couple by 616 Designs that have the same size paving as 'Modern Cobbles' but with damage to the stonework. These are all simple, well detailed and nicely understated contemporary urban resin bases. I'll be using these as the main basing for the individual miniatures mixed in with other more characterful themed ranges to add some variety. I may decide to weather the bases further down the line as they're looking a little pristine at the moment. I hope you've enjoyed Zedcember as much as I have; a great idea by Blaidd Drwg of the late but legendary 'Quick and the Zed' blog. Now I've got plenty of time to get my act together for Zombtober 2014, though I hope to get a good few more zeds painted by then!! Once I've recovered from my own NYE zombification I'll take some shots of the mob on the table top so you can see them in their natural setting. Finishing a miniature presents some interesting dilemmas. I held back on painting the eyes, initially due to option paralysis! While deliberating over pupil or no pupil, colour for iris and whites, maybe luminescent pigments or object source lighting etc I realized (with both reluctance and relief) that the cold empty stares from the growing horde on the painting table already worked quite nicely. The zenithal highlighting picks out all raised areas including slightly recessed ones like eye balls which pop against the shaded sockets. After the highlighting spray stage comes the Ogryn Flesh wash on the flesh areas. If you don't ink wash the eye at this stage it says lighter than the overall skin tone, it still stands out but doesn't stick out like a bright white painted eye can. Miniatures with poorly defined or completely recessed eyes work well too with their eyes hidden in darkness. It also seems fitting that no meaningful eye contact can be made with the horde. The empty expressionless eye strips the zombie miniature of any residual humanity. Zedcember has really helped focus on getting a batch finished, now I know what I'm up against with painting the rest! The truly ruthless zombie painting technique presented by RebelWithACoz has made painting up these cadavers a joy. The use of sprays and inks allows you to bring your mob up to a table ready standard in no time at all and any extra colour and detailing is really just a bonus!! The final touch of fresh gore (2 parts Tamiya Clear Red mixed with 1 part GW Druchii Violet (old Leviathan Purple) and 1 part Nuln Oil (old Badab Black) applied to appropriate areas after matt varnishing the mini) really brings the carnage to life!! Genius. Tune in next week for more foeted festivity and be sure to check out The Angry Piper too for the next Zedcember un-dead line! So the deal is to paint up 1 x zombie or survivor per week for the month. Having left 'The Walking Lead' to rot over the summer due to life impairing work commitments I'm taking this as a call to arms and an impetus to get up to speed with the groaning horde of plastic that's been amassing on the workbench. I've been tinkering with RebelWithACoz's utterly lethal zombie speed painting technique so armed with this the plan is to get them all into paint and finish off a handful for the festive festering. This week I've got them all into black primer and GW Doombull Brown base coat and half of these sprayed with Skeleton Bone and ink washed with GW Ogryn Flesh so the initial highlighting and skin tone are complete. All that remains are some coloured washes mixed from Vallejo paints for the clothing and some dry brushing with a grey-white mixed with the Vallejo base colour to pick out the highlights. Some detailing and basic gore completes the paint job. The mini is given a light coat of Testors Dullcoat matt varnish spray and then a touch of gloss blood to add fresh horror to open wounds and biting mouths etc... great fun!! I'm looking to finish 5 or so each week and bring many more nearer completion. Here are the first few. I'm sure there are some others out there too!! Too much time down the gym. With this in mind I've been scouring the growing selection of urban style resin bases on the market. There's an excellent selection of many common urban paving styles that should work together with a uniform paint job. I want to achieve a generic modern urban look as the overall base theme with contemporary street furniture; paving, kerbs, grills etc. Add to this a dash of urban disrepair and damage to tie into the post-apocalyptic feel. Humanities initial resistance of tanks and nukes legitimately opens up the world of 'war torn' bases; at least that's my excuse! I'd also like to achieve a variety of suggested environments from suburbia to the high street, car parks, play grounds, motorways and shopping centres, covering both the freshly abandoned and the utterly decimated. Looking beyond the urban base there are numerous scrap yard and rubble themed bases that could provide a cool urban waste land counter point to all that regular paving. There are some cool industrial / sci-fi ones out there that could also spice things up. There's always the grave yard option of course, I don't think I'll be able to resist picking up or making a few!! The themed basing could be used to visually define different groups within the horde, kind of like factions / units with their own specific environments. A minor subtlety but the horde would look pretty cool displayed with the zombies sprawling across a detailed and characterful landscape. I'm looking for round bases in a good variety of sizes from 25 - 120mm + to have a composite horde of individuals, small groups and seething mobs. Of the many manufacturers available, the following sites offer products that immediately fit the brief. Antenocitis Workshop have a great selection including some generic modern paving slab 25mm bases in 3 slab sizes both flat and with assorted kerbs, grills and covers. 616 designs have a small square cobble size paving with damage that complements the smaller size Anenocitis paving . Micro Arts Studio produce some excellent near future bases with litter and street paraphernalia. Escenorama have a cool contemporary urban range in 25,40 and 60mm with lots of nice litter and detailing. Tiny Worlds have an excellent damaged tar mac set in 25, 40 and 60mm. Dragon Forge have the best selection of larger urban bases, 25, 40, 60, 80 & 120!! Really nice bases with great detail. Anvil Industries have a City Rubble range in 25, 40 and 60mm. To add to the theme of urban squalor Black Cat Bases have some street litter, wheelie bins and bin bags and a couple of rats! They also have some nice tools, (axe, hammer, wrenches etc) as props for bases, abandoned in terror or dropped perhaps in a valiant last stand. There are some nice zombie mechanic miniatures out there too and a tool of their trade, discarded at their feet would be a narrative touch. Thinking about it, a work tool could make a decent replacement for the scythes and fantasy weapons on various miniatures that I need to convert. As an old skool zombie 'purist' I don't want these zombies to retain enough intelligence to use any tool or weapon meaningfully. I'll accept a severed limb (most manufacturers offer one) inadvertently used as a blugeon or an item they used to defend themselves with before turning and still clutch onto in rigor mortis!! Anyhow the time has come to consider basing some of these rotters up so a point and click shopping trip is on the cards. Any suggestions or ideas on themes, ranges and manufacturers would be totally appreciated. Time to hit the streets! !